Ascend mighty Mount Olympus and try to bring down a huge haul of treasure in Age of the Gods, a myth and legend themed progressive jackpot video slot from Playtech. Also on offer in this ancient Greek extravaganza is a free spins feature with random multipliers, a frozen wild with expanding multipliers, randomly added wilds and stacked wilds. Start your quest from between 20p and £500 per spin. As one of the online casino world’s biggest names, Playtech certainly know how to create a decent video slot. The first impressions are good as Age of the Gods has a suitably epic feel both in terms of looks and sound. Joining the lower value playing cards are a warrior’s helmet alongside a selection of god and goddess symbols. Very fine it looks too with the on screen action complemented by a suitably sweeping backing track. Thumbs up here then. Athena Free Games feature – this offers 9 free spins. The added extra is that every win during the feature will be boosted by a randomly added multiplier of between 2x and 5x. Zeus Free Games feature – once again 9 free spins are awarded, this time with a wild locked in place in the middle of reel 3. After 3 free spins, you’ll receive a 2x multiplier which will increase to 3x after 6 free spins. Poseidon Free Games feature – during the 9 free spins, Poseidon can strike up bolts of lightning from his trident and in the process turn up to 5 symbols wild per free spin. This is the most lucrative of the features with a potential 7,000 times your stake on offer per free spin! Hercules Free Games feature – a stacked wild will fill up reel 3 for the duration of your 9 free spins. After your initial haul of 9 free spins have played out, you’ll return to the picking screen – choose wisely here and you can be granted another set of any of the quartet of free spin features. Once again, the Hades symbol will bring things to a close. You can play all features various times before you uncover Hades so hopefully your luck will be in. There’s plenty on offer in the base game too – the main added extra here is the Pantheon of Power On Reels feature – this awards a 10 times stake cash prize when you land all 5 god and goddess symbols in any order. The really big money is on offer via the quartet of randomly triggered progressive jackpots – once activated, you’ll move to new screen and be presented with 20 coins. Each 1 contains a jackpot symbol. Match 3 identical jackpot symbols and that’s the jackpot you’ll win. Once the progressive round is triggered, you’re guaranteed to win at least one of the jackpots. The Ultimate Power Jackpot is the one to hope for as it can deliver truly life changing sums of cash. On the variance scale, Age of the Gods is in the medium to high range, offering potentially large wins from a single spin. 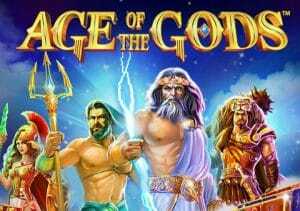 Featuring excellent design, a superb array of features and the shot at winning an enormous jackpot, Age of the Gods is a cracker of a slot that will appeal to pretty much all slots fans and not just lovers of the ancient theme. Just for your reference, this game is almost identical to Marvel’s The Avengers (also by Playtech).